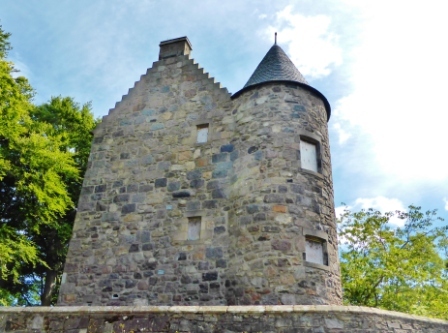 Mention the Wallace Tower and some smart Alec’s bound to chip in, it’s nae the Wallace Tower, it’s Benholm’s Lodgings, to which the appropriate response is, aye I ken but it’s bin the Wallace Tower for well over a century so it’s earned the name Wallace Tower. If someone turned up at my house and insisted it was so and sos because they’d lived there a few decades ago I’d tell them where to get off, wouldn’t you? Built for Sir Robert Keith, whose brother the Earl of Marischal founded Marischal College (once a separate university from King’s College) the house was also known as Keith’s Lodgings. Given its long existence – 500 years – it has seen a lot of comings and goings. 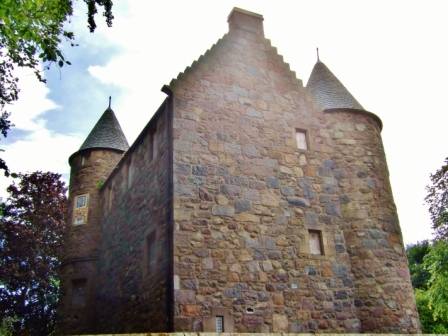 For most of that time it occupied a prime position the corner of the Netherkirkgate (the lower gate or port into the town – the Upperkirkgate being the higher up gate), above Carnegie’s brae, which came to be known as the Wallace neuk (corner). At one time the area was known as Putachieside. The home of Lord Forbes at Keig by Alford used to be known as Putachie. Lord Forbes kept a town house in Aberdeen, near Benholm’s Lodgings and referring to the area by his country house name stuck. It was near where the Aberdeen Market is now… beside Putachie’s house – Putachieside. I hope you’re still following – and one of the streets, which ran from Carnegie’s brae towards what is now Market Street (or as near as damn it) came to be called Putachie. Putachie has gone. The Netherkirkgate has gone. The Wallace nook has gone. The Wallace Tower has gone. 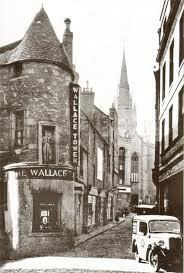 The Wallace name was used when a bar of that name occupied part of the building when it was slap bang in the centre of town not in its present location on a grassy knoll at Tillydrone. The low hill it stands on is the remains of a Norman motte. As for the name it’s possibly a corruption of wally meaning well (a nearby well-house) with the diminutive ie or y wally hoose or well-house for folks uncomfortable with the Doric. This is all a long way from the Wallace Tower’s current abode at Tillydrone. It’s a fine enough site for this fine wee building but for many Aberdonians of a certain vintage – it’s not its home. Home should be, they believe, somewhere close to the vanished Netherkirkgate – maybe close to the Upperkirkgate… maybe it could have occupied pride of place, or second place to Skene’s House in Marischal Square but then there is no longer to be a Marischal Square so it can be added to my banished list. Putachie has gone. The Netherkirkgate has gone. The Wallace nook has gone. The Wallace Tower has gone. Marischal Square has gone before it’s ever been. 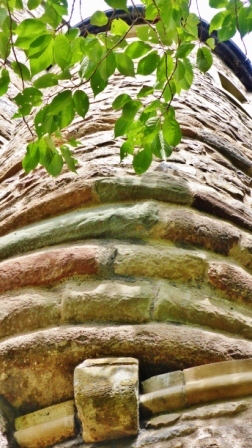 Rewind…why did the Wallace Tower go west? Think Marischal Square – what’s driving this corporate carbuncle? the ugly face of capitalism silly. It was a similar situation back in the swinging sixties. Marks & Spencers wanted to expand their store across from the Wallace Tower and councillors sucked on their pencil tips and thought how old fashioned this auld rickle of stanes looked in what could be a modern shopping precinct. What to do? Before you could say pretty fine example of a late 16th early 17th century rubble-built Scottish tower house it was howked up and trundled on the back of several lorries far enough away from the city centre that those pencil sucking councillors were no longer reminded that Aberdeen did once have some very fine buildings indeed. The M & S extension turned out to be a not-so-very fine a building or even a half-decent building but who cared? This was the 1960s and anything went then, even prefabricated lookalike every other prefabricated buildings that littered every other town’s high streets. Still, as we know when it comes to Aberdeen city centre it’s a case of knowing the price of everything and the value of nothing. Actually I don’t really mind the Tower being at Tillydrone for it is a good enough spot, at the edge of Seaton Park, but look at it – no, really look at it. When did you last see anything of architectural importance in Aberdeen look this bad? Well how about last week – and Westburn House. As far as preserving historically important architecture/introducing high quality contemporary buildings to the city Aberdeen councils would get straight As for corporate delinquency. Here we have boarded up windows to prevent another empty building falling victim to vandalism – the petty kind that ends up in courts and fined not the kind that is carried out on a large scale by local authorities. The original Benholm’s lodging house was constructed as a unique Z-plan tower house that was used as lodgings. In the late 18thC a wing was added and various adaptations have been made. At one time a balcony was built to provide grand views across the south of the area. There have been many plans to get the Wallace Tower back into some kind of useful existence but all fall through. It’s not connected with The Wallace … Aye we ken. Wallace never came this far north… So you say. Since it is in Tillydrone it would be good if that community could make something of it but everything comes down to having sustainable funding in the end. Given that it is so close to the University it might find a use but not at its loss of it as a public asset (although the Council might question that and presumably regard it as another liability). You can see the z-plan – or not. 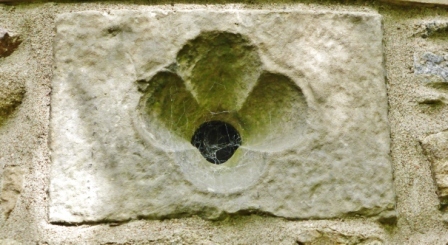 Corbelled features. Two round towers. The sculpted knight isn’t Wallace… they insist Aye, we ken, fit exactly IS yer problem, min? Who the rough and ready figure of a knight in a recess is no-one knows. It isn’t Wallace that’s for sure – William Wallace and his dug. It might be Wallace and Gromit. That is a joke by the way… in case the pedantic echo is still on my case. Some think it came from the nearby St Nicholas graveyard. 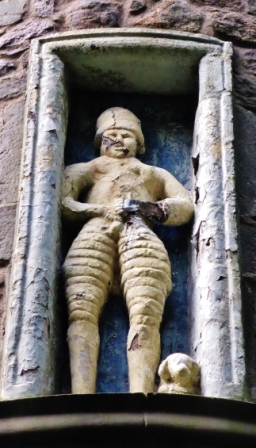 Whatever’s its provenance it is a rude representation of a Scottish knight with his favourite cur by his feet. He used to hold a sword – the knight not the dug that was made from a bent bit of metal. Definitely not worthy of The Wallace. Who he was we probably shall never know. Wouldn’t it be grand if it turned out his name was actually Wallace. He’s been broken and repaired and painted and broken and painted and repaired and broken. 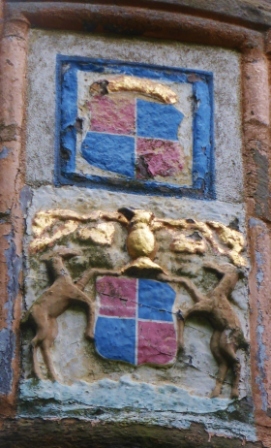 A remaining armorial panel is not in the finest condition but at least it’s remaining. 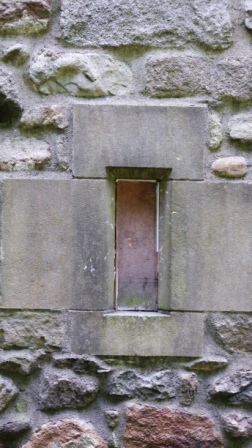 The walls had originally been harled and presumable painted in the old Scots tradition. As of March this year planning permission for a change of use from residential dwelling to mixed use as a community cafe and office was being sought. 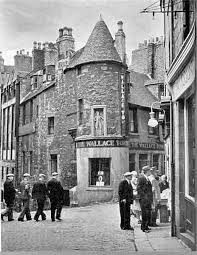 The Wallace Tower which has undergone so many guises including lodging house, bar, tobacconist, snuff merchants was once upon a time a council house, gadzooks, rented out, controversially, to someone who would later become a councillor and Provost. 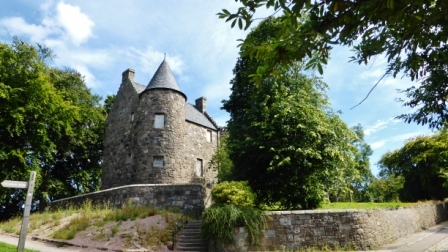 It surprised some Aberdonians that the rent for such a unique cooncil hoose was the same as for ‘any other three-bedroomed council house in the city.‘ (The Herald 3 Oct 1996) but when this tenant vacated the Tower no-one else was given the chance to rent it but we were into the era of selling off council homes so the council did well to avoid falling into that trap with the Wallace Tower. http://www.heraldscotland.com/news/12023249.Convoluted_background_to_portrait_of_provost_who_had_listed_council_house/ I’ve been inside the Wallace Tower once or twice and it wasn’t particularly attractive as a home – stairs to everywhere and fitted out in 1970s drab but that is just decoration and doesn’t detract from its importance as a medieval tower-house. 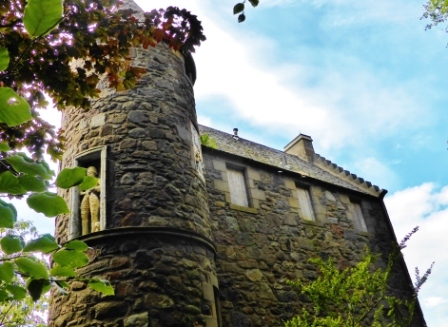 There is no question the Wallace Tower is a ‘lost gem’. It lies forlorn and unused. Largely ignored. Unwanted or rather unaffordable for those who would love to bring it back to life.